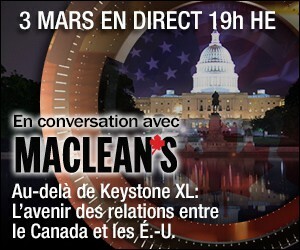 Welcome to live online coverage of the latest "In Conversation with Maclean's" town hall. 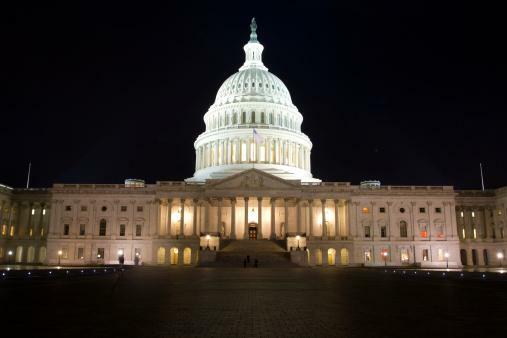 Tuesday’s broadcast from Washington, D.C. runs 90 minutes (7:00-8:30pmET). Join the conversation with comments and questions! Wells: the Keystone project is also hotly contested in Canada, with opposition from New Democrats. Liberals are OK with pipeline but not doing enough on climate change to make it palatable for U.S. approval. Droitsch: oilsands sector is keeping Canada from meeting obligations and introducing new oil and gas regulations. Bernstein: U.S. Department of Energy is investing in the oilsands to reduce carbon dioxide emissions. Shows U.S.-Canada technological partnership. Doer: difficulty on gas regulations is a lot of U.S. states don't want Washington involved. Droitsch: expanding production can't be done by Canada without failing to meet emissions targets. Doer and Droitsch now debating oil sands and climate change. Droitsch maintains that it is incompatible and clean energy is the answer. Droitsch: Canadian provinces are taking more action than Ottawa on climate change and clean energy. 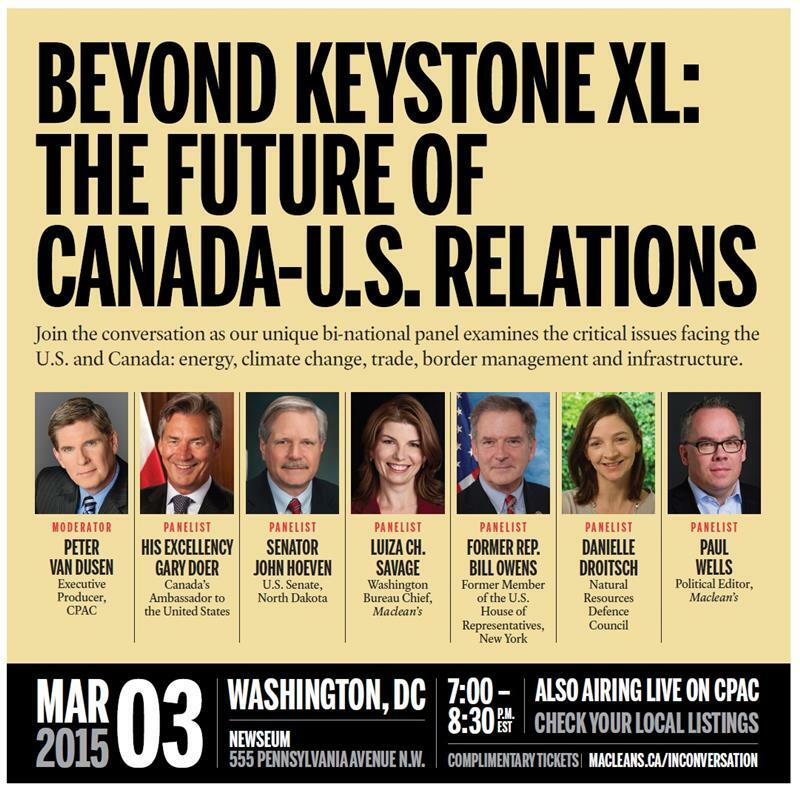 Here are some of people featured in CPAC's "Pipeline Politics" with Luiza Ch. Savage of Maclean's. Also, the original Keystone route (yellow) and current plan through Nebraska (black). Luiza Ch. Savage tells the five-year story of the battle over Keystone XL. Included is a visit to Nebraska, the epicentre of on-the-ground American opposition to the pipeline, to understand how local politics and environmental concerns influenced policymakers in Washington and Ottawa. Wells makes a key point that the Canadian option for sending oil to China and other Asian markets has not materialized as a viable alternative to Keystone. Savage: how do these issues go above the partisan political fray? Bernstein: a unique opportunity to combine resources and work together -- changing geopolitical dynamics in the Middle East, for instance. Owens: need to focus on NAFTA countries as an economically self-sufficient unit. Doer: the CPAC panel in five years will be about water, not oil. First audience question is from Rob Merrifield, former Conservative MP and now Alberta's representative in Washington. Merrifield touting Alberta's environmental record compared to oil exporters such as Venezuela. Droitsch does not agree that Alberta has a "best in class" environmental record. Tailing ponds the size of Washington, D.C., for instance, and continuing cancer concerns. Bernstein: Canada is transparent and we trust them. Let's do business there, not Venezuela or Nigeria. This concludes our live online coverage of tonight's town hall on Canada-U.S. relations. Thanks for watching! Canada and the oil industry have been far from upfront and open to Canadians. Perhaps after Canada's election, partisan divisive politicians will be gone. and can then focus on citizens' issues and environmental issues.